I’m not a huge dessert person. Though I do like them, I don’t often make them. When faced with a choice at a restaurant I’d go savoury every time. But when I’m feeling a bit sick I always seem to gravitate towards something sweet. I’ve had a cold threatening for the last couple of days and so today I decided I’d skip dinner and just eat dessert. Because I can. I was intending to save ALL my bottled fruit for winter, but I pinched one jar of white peaches from the shelves today and used it to make a sweet pastry. It’s silly really, but I always feel that something with pastry feels a bit special, even when it took only 2 minutes to put together. This is only made with bought puff pastry, but it still feels slightly fancy pants. Borg’s puff pastry is VEGAN, so are some of the other brands, but Borg’s actually label theirs, so I love them for it and always buy it. 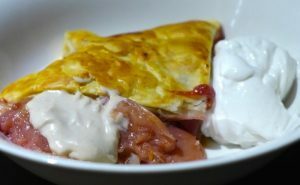 I served it with some cashew cream and home made coconut yoghurt. Drain the fruit and save the syrup. Place the fruit into the centre of the sheet in a rough square with the corners of the fruit 'square' pointing to the flat sides of the pastry square. Fold the corners of the pastry so that they all meet in the centre and pinch together. Brush the top of the pastry with some of the syrup. Place the parcel into a 180 degree C preheated oven and cook for 20 minutes or until crisp and golden.